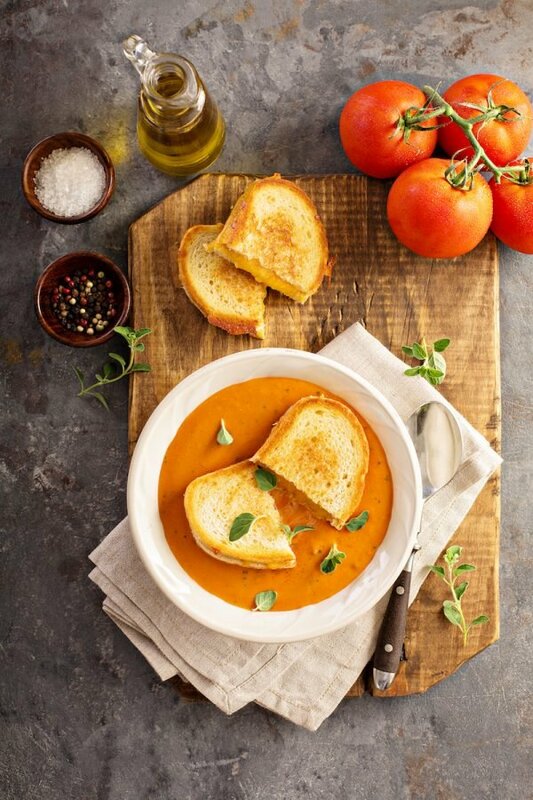 Panera Creamy Tomato Soup Copycat Recipe: this simple recipe is my families favorite creamy tomato soup when served with a big buttery grilled cheese sandwich! Despite the heat, my mind and body have already decided it is Fall. Like full on FALL — even if it is still in the 90’s here in Florida. 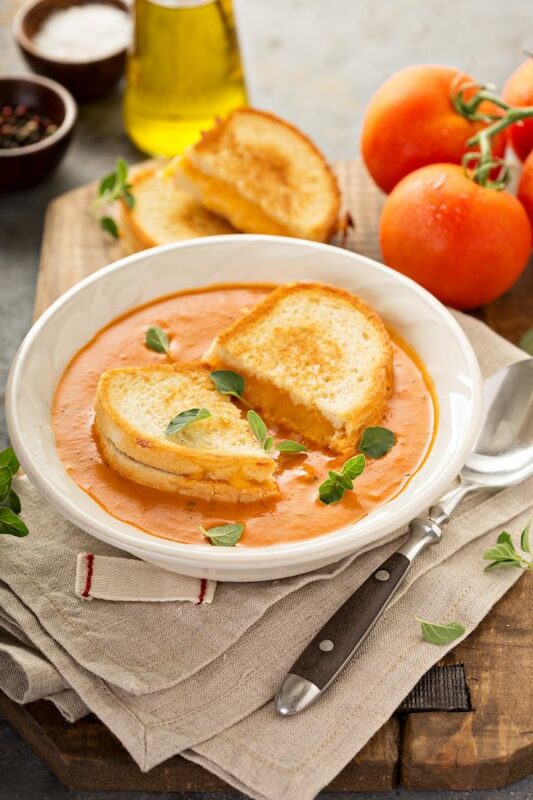 And that’s why I am brining you this Panera Creamy Tomato Soup Copycat Recipe in September! I have been asking anybody and everybody I know to go to Hobby Lobby to buy Fall decorations for my house. I am also fighting myself on getting a Pumpkin Spice Latte from Starbucks. How can I drink a pumpkin flavored hot coffee in this weather? It’s just not ok. Somehow my craving for soups is even stronger than my craving for pumpkin spice lattes and fall decorations. I have a notebook where I keep ideas of recipes I want to make. If you look at it today, it has 11 soups in a row — no joke. I keep asking Jorge if he will eat soup for dinner yet…and his answer is “NO.” every. single. time. I always ask back, but what about your favorite Taco Ranch Chicken Chili?? No! Ok, how about my favorite, One-Pot Bacon Corn Chowder?? NO! No soup until it’s under 80 degrees! He is SUCH a kill joy. So I finally said screw you, I’m making soup. Tomato Soup just like at Panera and you can’t have any! Well ladies and gents, guess who ate a big bowl of this amazing tomato soup and a big grilled cheese?? Jorge. The soup naysayer. This tomato soup is a recipe that has been a long time in the making. I tried using fresh tomatoes, but it was double the time and the flavor wasn’t close enough to the one I love to get at Panera. “Creamy” is in the name, but the soup at Panera is really not all that creamy. So I learned to use only a little cream. I also add a little sugar to cut the acidity of the tomatoes and not too much basil. And I add a little parmesan cheese – but it’s totally optional. Is this the exact same soup you get from Panera? No, probably not exactly. However, it is dang close to it! And bonus? It only takes 30 minutes to make! The next time I make it, I plan on making a triple batch to have extra to freeze the leftovers. That way whenever I am in the mood, I can just pull a bag out from the freezer! UPDATE: Panera changed their soup recipe a while back a little. But scroll down to read the reviews…this tomato soup still ROCKS and you must make it asap. To make your meal perfect, make a grilled cheese with fresh thick crusty sourdough bread, havarti cheese and a ton of real butter. That is my PERFECT grilled cheese. In a heavy bottomed pot (or dutch oven), heat olive oil over medium-high heat. Add garlic and saute for 30 seconds – until fragrant. Add onion and cook, stirring as needed, until translucent – about 8 minutes. Add San Marzano peeled tomatoes (juice and all), chicken stock, and sugar. Bring to a low simmer. Cook uncovered, for 12 minutes or until it has thickened. Add the heavy cream, basil, oregano, red pepper flakes and season to taste with salt and pepper. OPTIONAL: stir in parmesan cheese and serve topped with buttery croutons. You must be magic or something. I needed something for dinner and your post popped up! I can only have soups right now and I need of the comforting and creamy. I am still trying to let go of winter (I am in the southern hemisphere), so I guess I am feel the same as you but with winter. It might be heating up over here but I still need soup! I did a version of this soup from Panera right about this time last year! I remember b/c it was HOT out and I was making soup 🙂 Yours is so gorgeous. Makes me want to dive in – just as soon at it’s not 90F here! lol pinned! This looks seriously perfect!! Love this Jess!! I love the creamy tomato soup from Panera. I can’t wait to try this version which looks incredible! I have the hardest time thinking about fall when it is 90 degrees with 70% humidity, ugh. And I thought I was the only one who loves fall!! Great looking soup! It’s like we’re on the same wavelength…I made a batch of creamy tomato basil would and a some fresh bread (for grilled cheese sandwiches) just last week! It totally hit the spot. I am so ready for fall! Yes, please! This looks so yummy and so creamy and so comforting! I want it all! I love Panera’s soups, but this looks better! Your soup looks absolutely delicious, can’t wait to try the recipe. I won’t be finding the canned tomato brand you used here in Finland, but I’ll try the one I have. But there is a part in the recipe that I do not understand: What is this “half and half” that I’m supposed to add? Haha, “screw you”–I totally would have done the same thing. Connor sort of has to just go along with my food cravings, luckily, he likes to eat everything, so usually doesn’t end up minding all that much. This soup looks heavenly! I love a good creamy tomato soup. I am with you; I have switched to full-on Fall mode. You’re killing me with this recipe; it looks so delicious, not to mention that grilled cheese is the perfect partner. This Mississippi heat is KILLING me! I’m ready for soup, too! MAYBE the pumpkin spice latte…maybe. I could (and do) eat soup at restaurants any time of year. Notoriously. But I don’t usually make it at home until it cools off a bit in Texas. Such a classic recipe. Do you think you could make it vegan with almond milk instead of the half and half? To be honest, I don’t have a lot of experience using almond milk in savory cooking. If you find that it normally works in soups, then it is worth a shot! 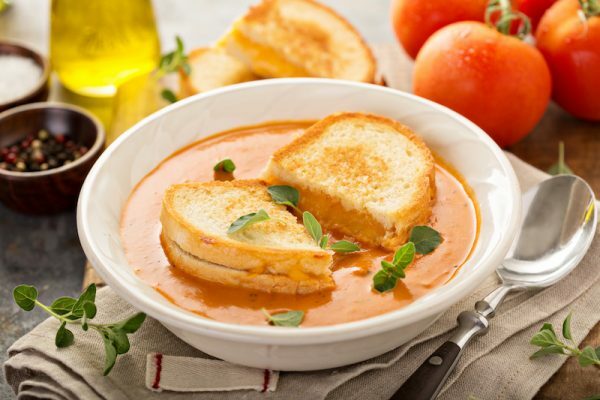 This looks like the perfect tomato soup, especially along side a grilled cheese sandwich. Hello comfort! LOVE San Marzano tomatoes! Tomato soup and grilled cheese is basically the best thing ever! I love their tomato soup so I am definitely making this!! Jessica this looks phenomenal! I can’t wait to try it. Delicious! I love a good creamy tomato soup and hate anything canned. This looks so simple and easy, going to have to try it! Making this for dinner tonight…can’t wait! Just made this and it was yummy. I used rice milk instead of half and half. Only thing I’d do different is maybe make a roux to give it a creamer texture. Other than that it was excellent. I had some hamburger buns that needed to be used up so I made croutons with garlic parsley salt and a sprinkle of thyme. Thanks for sharing! I’ve been waiting on you to post this since I saw it on FB! (Actually, I’ve been waiting until you posted it AND I actually had time to catch up on blogs.) I LOVE from Panera,and that is a GREAT idea to make a double batch and freeze. I’m totally doing that one weekend soon. PS. I made slow cooker soup on Sunday (White Chicken Chili) and another soup today while I’ve been home with a slightly sick Elliott (Curried Cauliflower Soup). I’m LOVING soup season, even if we aren’t technically there yet! Found you via Pinterest and made this tonight – phenomenal! So easy and delicious. I used fat free half & half and still came out rich and creamy. Made soup for the first time for some guests. Everyone enjoyed the soup. I’m glad I stumbled onto your site. Looking forward to trying the other recipes found here. This soup is very tasty, but panera’s has a little spice or kick to it. Thanks for the recipe. Try a little smoked paprika, and a pinch of cayenne powder. I added just a pinch of cayenne and a tablespoon of butter and, to me, it tasted just like Panera. It was perfect! Thanks for the recipe. Perfect! Pinch of cayenne and butter do the trick. Looks like some darn good cooks on this thread! Add 2 T of tubed tomato paste to the onions and garlic when sautéing as well as about a 1/2 tsp of cayenne red pepper flakes. I also add one cube of Rapunzel (organic) boullion. Himalayan sea salt and fresh ground black pepper to taste and some grated parmesan cheese. I think you’ll get the ‘kick’ your missing from this really wonderful basic recipe! The result is 99% dead on! How much parmesan cheese did you add? 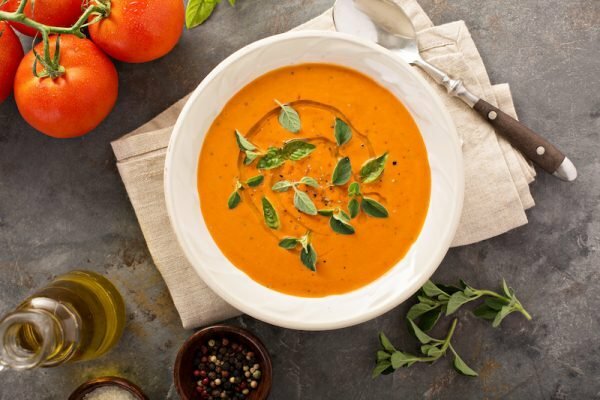 Thanks for the recipe – I found it by googling the day after my husband and I went to Panera and he had the tomato soup and I had the butternut squash soup which was disappointing to me. The onions in the soup I made were a little crunchier than I would have preferred – next time I will cook them longer. But really like this soup, shared some of the leftovers with my mom and she liked it too. YUUUUUMO! Made exactly to the recipe but instead of 2 cans tomatoes, I also had a couple lbs of fresh San Marzano tomatoes. I blanched them, removed the skins & proceeded with the recipe. Used my immersion blender. Also, my farmers market had spinach Parmesan bread that I used for my grilled cheese sandwiches. Buttered both sides, shredded fresh fontina cheese, added some sliced delicious heirloom tomato, torn fresh basil, topped again with more cheese. The meal was outstanding. TIP: cut your cheese sandwiches in half, then sliced them in either finger size or croutons. So yummy when you dip them into the soup. First, let me say I am making this tomorrow. No waiting. Nope. Can’t wait. OMG this looks good! Thank You! Next, the “screw you” part in particular cracked me up. I just love, love a girl with attitude! To be honest, the entire post had me smiling………. I’m new your site, but I bet I’ll be an avid follower. This was AMAZING! I made it tonight for a quick supper for my family of 5 and they all loved it. Even my 3 year old ask for seconds! Thanks for an awesome tomato soup recipe for the whole family! I don’t usually cook but had to try and find a recipe for the Panera tomato soup because I love it a lot. Just made this today and not only was it relatively easy but the soup turned out PERFECT! I can’t get enough of it. The tomatoes I got had basil and oregano seasoning mixed in already so that made it even easier and still tasted great. I also added a little bit of grated cheese but don’t know if it made a real difference. Long story short, thank you for putting in the work of figuring out the recipe! I’ll be making this for a long time to come. Really enjoyed this tonight. Thanks! Made this soup and I used 1 28 oz can of San Marz. Tomatoes and 1 28 oz can of TOMATO PUREE BOTH CENTOS!! An both SAN MARZ. ( WHICH MAKES A HUGE DIFFERENCE IN ANYTHING YOU ARE MAKING W/ CANNED TOMAOES) the Tomato puree is not as thick as PASTE would be but is a fuller in flavor because the tomaoes are already pureed as u would do with a blender…but i also used 2 cups of my own chicken stock I made a few days ago. I have made tomato soup with the canned tomatoes only as in this recipe but…after watch alot of Micheal Symon sauces and other old recipe research I decided to use 1/2 and Half with tomatoes and puree..( i use puree in other recipes at times)… YOU WILL get a richer flavor and hit it with a dash of crushed red pepper while onions are softening or a dash of cayanne to spice it up..if you like a little kick! This is a very good base recipe that will allow for a little personalizing! Grate some asiago or Parm Regg. In while cooking and over at the end..its GREAT THAT WAY! THE CRILLED CHEESE CAN ACTUALLY BE MADE INTO SMALL CROUTONS AND GO RIGHT ON TOP FOR YOU CHEESE LOVERS LIKE ME! MEAL IN A BOWL FOR SURE! THANKS FOR POSTING THIS RECIPE! Also, it will taste better the next day!! Made this soup for dinner last night and it was delicious. Served with homemade mac and cheese and crusty seven grain baguette. It was a big hit with my vegan/vegetarian family. No leftovers this morning! Will definitely be making this again soon. I have just made it and it’s awesome. Thank you very much!!! I especially appreciate publishing the pictures of the soup and the cans- they inspired me to go grocery shopping late and night and now I feel happy that my family will have good soup tomorrow while I’ll be working late. Thank you. For everyone who is thinking about making it- it was super easy. This is the best Panera copycat recipe I’ve ever tried! I just made it and the family loves it! This was a perfect ending to a cold autumn day. I think this recipe will be a staple in our home! Thank you!! How can I get recipe. Beginning, before the comments section. In response to her question about using Almond Milk, if I want to make a vegan version of any recipe asking for cream or half & half, I do substitute with unsweetened Coconut milk (bought from the refrigerated section – do not use ‘in the can’ version. I made this tomato soup recipe using unsweetened coconut milk and it came out divine! I made this tonight for my family and it was phenomenal! Awesome job with this recipe; so identical to panera’s! I couldn’t find the brand of tomatoes you used so I bought meijer organics. It was awesome! Will make it again soon! Can you buy the San marzano tomatoes fresh? If so where can you usually find them? As I try not to eat to much that comes out of a can.I’m excited to try this recipe!!!! It looks amazing!!!!!! Wow! My husband requested grilled cheese sandwich with tomato soup for dinner…I have never made tomato soup before, and this stuff was delicious! I just had Panera tomato soup yesterday, so that’s why I did a search for Panera-esque tomato soup. Your recipe is fabulous. Tastes just like Panera, and it’s so easy to make. I’m saving it. Definitely making it again! Thanks! I had to come back to your web page and give credit where credit is due. I made this for a girls’ vacation at the Northern California coast last weekend along side some grilled cheese sandwiches. It was a huge hit! 12 women can’t be wrong! I heard comments like, “This is the best tomato soup I’ve ever had in my LIFE!” and “You could sell this professionally!” I wanted to mention I went with the recommendation of a previous commenter and substituted one can of tomatoes for one can of tomato paste because I wanted that concentrated tomato flavor. Thank you so much for posting this. It’s going to be one of my staples. This is a FANTASTIC recipe!! I loved it! 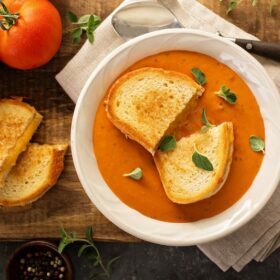 My 15 year old daughter LOVES Panera creamy tomato soup but as we all know it can be pricy, so I decided to look online for a copy cat recipe and VOILA! I did make a few minor adjustments (to make a larger batch, and because I was missing a couple ingredients) but it still turned out delicious and it’s about as close as I think I would ever get to Panera’s actual recipe and taste. Thank you!! YUMMY!! I should say I added a can of tomato paste and used an entire 26 oz container of chicken stock (but I used no salt added, and there was no taste difference, or at least we didn’t think so. We are always trying to reduce salt intake.) I thought next time I may try using stevia instead of sugar, to reduce the sugar content as well. Still with these changes, the soup was thick enough and phenomenal! kudos! Made this soup for my mom who la la loves tomato soup, and lets just say she had 2 bowls, Thank you for the recipe!! This is my favorite soup recipe. I’ve made it several times, exactly to recipe, and it’s turned out great every time. Still tastes great halved. I’ve made it a weekly dinner item with mozzarella basil sandwiches on sour dough. I love to try cooking new recepies and I’ve added this one to my favorites! Even though it’s “spring” here in the Northeast Coast of the USA, it still feels like winter. I’ve recently have been loving Panera and their creamy tomato soup is amazing. So with the cold weather I decided to try out this recepie! Well I loved it! It came out to be less creamy than I wanted it to be because I don’t measure my ingredients, but I just go with my gut feeling. I still loved it! I didn’t think it would be that good but it surpassed my expectations! It wasn’t difficult to make and it’s definitively worth it! I can’t wait to make some more!! Thank you for the recepie!! I was excited to try this recipe because I love tomato soup! The taste was great, but I didn’t care for the chunkiness of the soup (even after pureeing it for a long time there were bits of tomatoes and seeds floating around, which turned me off). Had the consistency been creamy I would have loved it. I was just looking at your recipe for tomato soup (looks yummy). If you want less calories you can add cream cheese instead of the half and half. I was told this by a restaurant chef that eat at. I think it was even better than Panera’s. Great recipe! Was wondering if you could freeze it? Made this recipe and followed the ingredients to a T. It was horrible. The taste reminds me of an onion – tomato spaghetti sauce. Definitely would not recommend this one. I agree!I followed the recipe to a t and it tasted like sweet tomato sauce. I will have to get creative. There is a spice in Paneras soup that’s lacking in this recipe. Overall the consistency was good. I made this soup recently, we loved it! We finally had cold weather in Houston so it was perfect. Hello, does anyone know what the calories would be for one bowl of this soup? and I’m sure could use fat free half and half – right? or would it not come out right? Looks like great recipe and will try! Thanks. It will not be as creamy, but yes you can use fat free half & half. I do not do the nutrition on recipes, but you can calculate any recipe’s nutrition with sparkrecipes.com Enjoy! I used heavy cream instead of half and half..made it much creamier!loved it!! I followed recipe to a T as well. It tasted so acidic! Tried adding more cream, stock, and sugar. Didn’t work. Very disappointed. It’s great pleasure to get a chance to comment on such a nice and informative blog. I love to enjoy reading new things. Thanks for share and keep it up. Hi! Thanks for the recipe. I have canned tomato soup for years and it’s just near as chunky or thick as I’d like. I didn’t know if you had experience with canning this recipe? I would imagine it would just have to get back up to boiling before putting into the jars and then can it for 20 minutes in water bath canner. Any thoughts would be awesome! Thanks! HI Kristy! I am sorry, but I honestly have no experience canning. It is something I have always wanted to learn, but I do not have any helpful tips. Sorry I can’t be more help! 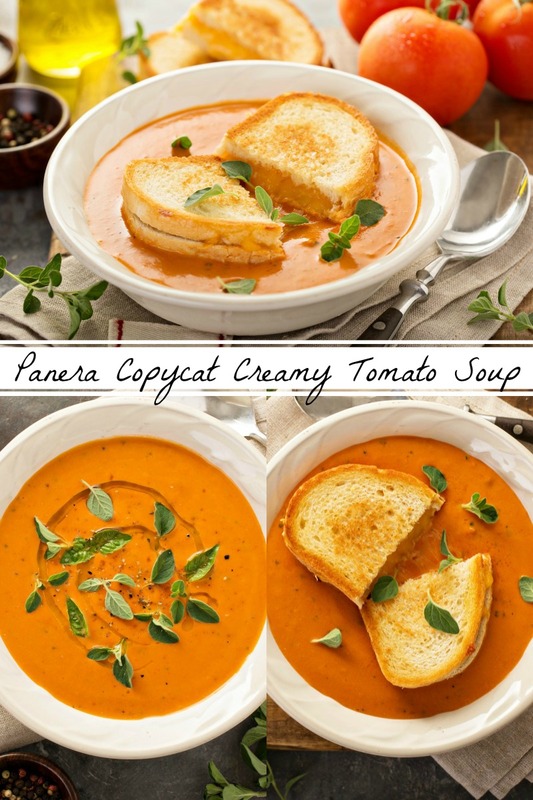 I was hoping for a real copycat recipe for Panera’s Creamy Tomato Soup. It just didn’t make the grade and too much sugar. I won’t make this again. Don’t forget garlic doubles when you freeze it. Easier soup — heat V-8 juice! You know jessica. Delicious recipe you have shared. My mouth is watering just after looking at it. I will definitely try this soon. Thanks for sharing. Wow! It’s looking so delicious and yummy. I made tomato soup with added cream and some sugar. I am very glad that I found this recipe from your website. I just tried it at my home. It is amazing. 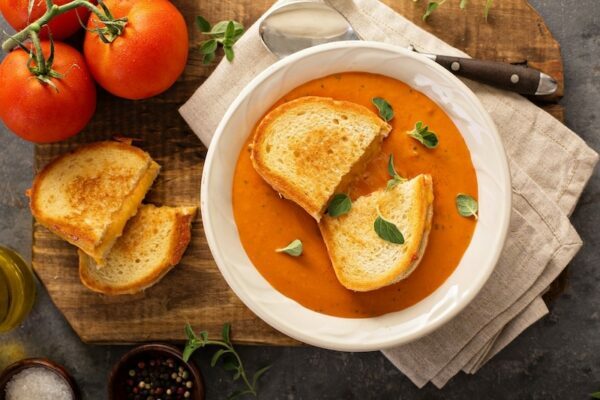 I’m already dreaming of tasting this soup right now but the other thing that caught my eye is that gooey cheese oozing out of the grilled cheese. Do you mind sharing the recipe? Please? It is unbelievably awesome…..now I have a dish that I can take to my next pot-luck. Thank u for publishing it. Thanks for taking the time to come back and comment! Glad you enjoyed it!! I’m so happy to have found this recipe! I made it today and it was PERFECT!!! I am by no means a cook at all and it was simple enough for me to make it. I love this soup at Panera and I will be making it all the time now at home. Made my day! Even though I didn’t have the lid closed all the way on the blender…made a mess EVERYWHERE and burned my arms. Even so, I’m so glad it turned out so well!!! Thanks so much for sharing!!!!!! So glad you liked it Robin! And OUCH I have done that before and know it hurts!! A.ways put and hold a wet dish cloth over the top of the blender when processing hot ingredients and process in small batches. Immersion blenders are wonderful because she you don’t get the swoosh of hot coming at You! I am making this version except, Ihave the 1st batch finished – it is yummy!, and I added the cream just to my bowl. I am going to can this 1st batch and hope it does well. Of course, you must know, I am using 30 gallon of fresh tomatoes (mostly Roma). I cored and cut in half around like you were going to slice them and removed the seeds with my thumbs. Got them coo,ingredients and slowly as it got hot, the skins slip off and come to the top. I cooked it down for 14 hours on low, added all the spices and, it is the most heavenly fragrance in the house! I put the gutted tomatoes in my huge 20 stainless sauce pot in small batches and cooked until the skins were beginning to slide off and removed and did it to the comlpete batch. I added 4 cleaned, seeded and chopped butternut squash and in 16 gallons of tomatoes, spices… I added about 1/2 cup of brown sugar. I cooked this for almost 15 hours, adjusting the seasonings as needed. WARNING: NEVER EVER COOK TOMATOES IN AN ALUMINUM POT, CANNERS ARE USUALLY ALUMINUM. They will be very acids if you do and the tomato will leach the aluminum. I PROCESSES 36 PINTS OF THIS WONDERFUL SOUP. Made this soup last night and it was great. Panera’s version does have a more robust, spicy flavor though… I’ll try adding a little cayenne like one commenter suggested. The consistency was perfect though – exactly like Panera’s. Never going back to store-bought canned tomato soup again! Thank you so much for sharing your recipe! I agree with some commenters that this soup needs a little spice. For me and my family, the soup was way, way too sweet. Next time, I will start with 1 teaspoon, not 2 tablespoons of sugar and add a few shakes of red pepper flakes. I was craving Panera tomato soup today and I googled and found your recipe. YUM!!! I didn’t even have all of the ingredients as you outlined them, but I used what I had and I am a satisfied sister! I used one large can of diced tomatoes, one large can of tomato sauce, and a can of coconut milk since I didn’t have the half and half or the tomatoes your recipe called for. I used the chopped garlic from the jar in the fridge, a fresh onion, dried basil, dried oregano, Himalayan pink salt, ground black pepper, a little parmesan cheese, and broth. After cooking and blending, I served it with croutons and a little parmesan cheese sprinkled on top. Served it with my own version of a panini (made with the waffle iron) and I was most content, to say the least! Forgot to add that I used demerara sugar rather than white sugar. Making this tonight! I forgot to pick up the basil but the tomatoes I bought have basil. Will this change the flavor much? Not sure why all the great reviews because this lacked taste to me. Tasted nothing like the soup I had from there last night. Perhaps they changed the recipe from when this was first submitted. Trie this last night and it came out great! Adding to my faves! Thanks for the recipe! I’ve been looking for a close recipe for Panera’s creamy tomato. This was good and close but something was still missing, i dumped a huge helping of shaved Parmesan cheese and bam tasted almost identical to me. Our 5 year old ate it up! Love the taste – is there any different type of canned tomato I can use that doesn’t come with seeds? Cannot get over the texture of biting them! Just made it today – made a few substitutions because of what I had on hand. Purple onions & fresh oregano. 3 out of 3 people loved it. My daughter – who previously “didn’t like soups” said, I guess I like soups now. Thanks for a great recipe and thank you for your effort in maintaining your site. Loved the panera soup. Has anyone made it as a vegan version? I was thinking of substituting almond milk and a 1-2 tbsp cornstarch for the half and half. Any recommendations? The soup tasted amazing however the texture was almost like I grated tomatoes instead of the traditional smooth creamy texture. I used the blender. What did I do wromg? Last week I went to Wawa and got their version of Tomato and Basil Bisque which was awesome so I googled it and found this recipe. I’ve never had the Panera version but I can tell you this recipe came out almost exactly like Wawa. This was delicious and easy to make with minimal cleanup afterward. I went exactly by the recipe which is a hard thing for me to do most of the time and was rewarded. This recipe was great. I just whipped up a grilled Ham and Cheese to go with it. The older I get, the more I appreciate food like this. Thanks for the recipe! I used this recipe as a guide to make tomato soup last night. I just used what I had at home. One 28 oz can stewed tomatoes and two 14 Oz cans of Italian diced tomatoes instead of San Marzanos. The only other thing I changed was adding more broth, and I skipped the sugar and cream. I tasted it before adding those missing ingredients and it was delicious. It was plenty sweet and I didn’t have any cream. A grilled ham and cheese rounded out the meal. Thanks for the recipe!! I used the suggestions in the comments and added 1/2 teaspoon of smoked paprika and about 1/8 teaspoon of red pepper flakes (my son doesn’t like spicy), 1 tablespoon of Earth Balance, plus 2 tablespoons of tomato paste in a tube to the onions/garlic the last few minutes they were cooking. I also used SO Delicious Coconut Milk Creamer instead of Half and Half to make this a vegan dish. I served it with grilled cheese made with Daiya American slices and Earth Balance. The slices melted to a creamy, gooey goodness. The soup does taste just like Panera. Love it and this will be a repeat meal in our household. Thanks for the recipe. I agree using good canned tomato, Cento San Marzano. Used 1 tablespoon sugar (even that amount might be too much), no chicken stock, 2 sticks butter instead. About 1/3 cup heavy cream, and lots of salt. Panera soup, if you look at the calorie count, is much more fattening than this recipe, thus why I used butter instead of chicken stock. Just made this soup it’s fantastic ! Can’t wait to bring some to work tomorrow! I made this soup today on a quiet, snowy afternoon. I followed the recipe exactly except I substituted dried herbs. The only other variation was that I only used 1 can of tomatoes because I misread the recipe. I did add some tomato paste though. This was absolutely delicious with grilled cheese! I’m so glad I found your website! A great soup for a cold stormy day! Nope. Not close. Is the recipe good? Yes, we had a really nice bowl of tomato soup with a melty, yummy grill cheese. But Panera? Nope. Nope. Nope. Not close. Not even in the same zip code. Make this because it’s tasty and tres’ easy, not because you think you’re making a Panera knockoff. Nope, you’re not. Nope. Nope. Nope. I’ve made this recipe so many times but I had to finally leave a comment!! It’s always SO good! I’m vegan and so is my family, so we sub coconut sugar for regular sugar, unsweetened almond milk or unsweetened coconut milk for the half and half, and homemade vegetable broth for chicken broth! We also add a few tablespoons of nutritional yeast (vegan cheese-like flavor) and a little crushed red pepper for kick, sometimes some earth balance (vegan butter) Still tastes just like I remember Panera’s to be! Thanks a ton for this recipe!! I forgot what Panera’s soup tastes like, and no longer care. I love this soup and will probably get burned out on it. Now I no longer have to go to Panera for this soup. 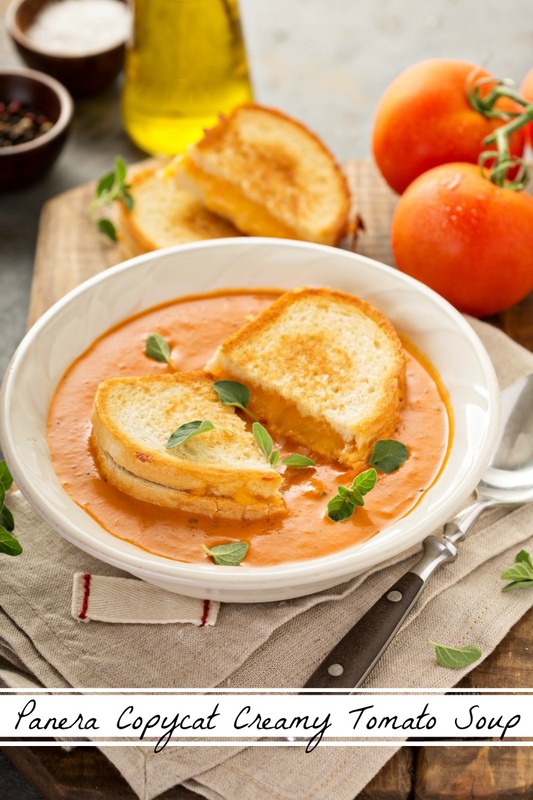 This is my go-to recipe for tomato soup! Thank you so much for sharing this!!!! This is a fantastic recipe!! I followed it to a T and it turned out exactly like Panera.. literally cannot tell the difference. This one is a winner for sure! I will be using this recipe for many dinners with family and friends. Thank you!